I made a strange discovery today, and it kinda weirded me out. A Bald Squirrel jumped out at me twice today. Once walking my way to my son's school for lunch, and once on my return. Have you ever seen a bald squirrel? Is it rare? Is it dangerous? Should I call Animal Control or the Humane Society or something? You Tell Me...cause it's kinda creepy lookin. Some hair loss in gray and flying squirrels is thought to be an inherited condition where the hair follicles are non-functional or absent, although studies confirming this have not been done. 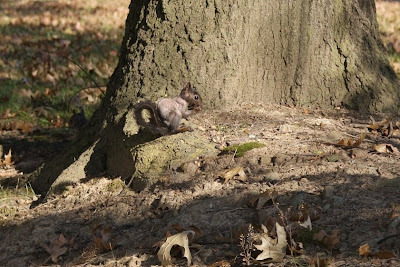 These squirrels have normal, but bare skin. 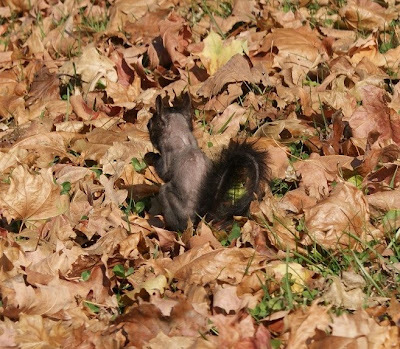 The next time you see a squirrel with hair loss, don’t become alarmed. In most cases, the hair will return with no apparent ill affects to the squirrel, other than perhaps some embarrassment and name calling among his squirrel friends. It appears that it isn't as uncommon as we thought, and is nothing to be alarmed at. Could be mites, or the hair folicle thing. I'm not sure about a bald squirrel but my sister has black squirrels near her house. I always thought they were all grey. That is so interesting, but kinda creepy that it jumped out at you!